We’ve all been there: you’re trying to get a sound system set up for a party but can’t connect the device you want to your speakers. Maybe you’re in the car and you can’t face listening to the same five songs on the radio again. In these situations, you could really benefit from having an auxiliary (or aux) cable handy. These allow you to connect anything with a headphone jack to an output, be it your car stereo or a portable speaker. Take a look at the table below. In it, you’ll find the name of some of the best auxiliary cables on the market, as well as their length. We’ll be comparing these to find which is the best overall, so don’t make a decision just yet. Let’s discuss our evaluation methods briefly. We’ll be taking the strengths and weaknesses of each of these products in order to provide you with a balanced overview. After we’ve covered all of these cables, we’ll consider what we’ve learned and choose which is the best. Now that’s out of the way, let’s begin with the AmazonBasics auxiliary cable. Sometimes the simplest solutions are best. 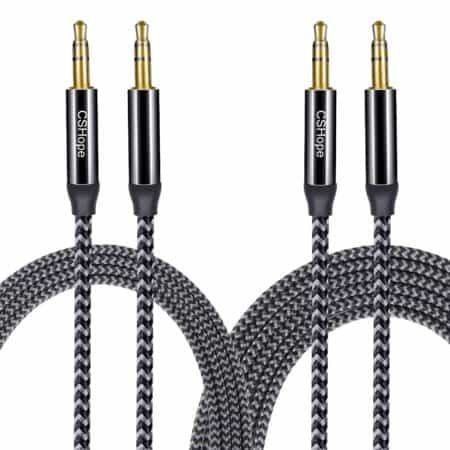 If you’re just looking to connect your phone to a speaker in your home, you likely don’t need a big, fancy braided auxiliary cable. In fact, this cable from Amazon will likely fit the bill. It measures four feet long, although two-foot and eight-foot variants are also available. These cost a little more, but considering the four-foot cable costs around $5, it’s still not a huge investment. But wait, there’s more! This cable even comes with something most other low-cost models don’t: peace of mind. If it breaks through no fault of your own within a year of purchase, Amazon will replace it at no additional cost. Not bad for a cheap product, right? The plugs on this cable have a stepped down design to ensure a snug and tight connection. This helps to prevent the cable from slipping out right in the middle of your favorite song. They’re also gold plated. We know what you’re thinking: aren’t gold plated cables usually really expensive? The answer might actually surprise you. Sometimes manufacturers try and increase the price by playing off of people’s misconceptions. Back in the analog days, gold plated cables used to increase quality ever so slightly. However, now everything is digital, so it makes zero difference. The one advantage that gold plated cables have is that they are more resistant to corrosion. Even if you somehow manage to get the ends of this aux cable wet, it’s not going to rust. That said, we’d still advise you don’t take it into the tub. A lot of manufacturers try to draw you in with a slew of fancy features whilst completely neglecting the basic functionality of the product itself. Thankfully, UGREEN is not one of these. Their auxiliary cable is pretty decent and better still, it’s highly affordable. This cable comes in four sizes, 1.5, 3, 6, and 10 feet long. You also have the choice of a plain black, red, or white cable, and we were pleased to see that the color doesn’t affect the price. So how much does it cost? The 1.5-foot long aux cable costs somewhere in the region of $5. Inch for inch, this makes it more expensive than the AmazonBasics cable, but it justifies this with its features designed to prolong its life. Take a look at that 90° jack. If you plug a straight jack into a device, it’s prone to being knocked around, which can not only damage your cable, it can necessitate a whole new 3.5mm jack for your cell phone or iPod. In lieu of a warranty, this cable comes with a flat cable. At first glance, this doesn’t appear to do anything but look cool. However, this actually serves to prevent the cable from tangling as often. Put it this way: UGREEN have created a durable aux cord that reduces damage AND frustration – what more could you possibly want, gold plated cables? Well, if so, you’re in luck. Here’s the problem with some of the auxiliary cables on the market right now: they’re either way too long or way too short to be considered versatile. CSHope have tried their best to rectify this problem. They’ve bundled two aux cables together at a reduced price so you’ll always have one that’s the perfect length for your needs. This pack costs around $8, and while it doesn’t come in any other lengths, you should find that between the 10-foot cable and the 3.3-foot long one, you’re pretty much covered for anything. Both of the cables are braided, which provides a good deal of protection and should help prevent any fraying that might occur over time. These cables have an expected lifespan of 8000+ bendings, so they should last for a considerable amount of time. If you’re still worried about protecting your investment, you can purchase a set of metal braided cables instead. Surprisingly, these are around a dollar less expensive. But wait, there’s another option too. If you’re feeling decidedly patriotic, you can buy a gaudy red, white, and blue set of cables emblazoned with “I LOVE USA”. We can’t say for sure what was going through the designer’s head here, but they are slightly cheaper, so that’s good. CSHope have actually gone and provided a slightly longer warranty period than Amazon did too, which is great to see. Instead of a year, these cables will be covered for 13 months, so if you manage to break them within that time, you’ll get your money back. Okay, so we’ve seen some great general purpose aux cables so far, but what about something that’s geared a little more specifically? This auxiliary cable from JacobsParts is the perfect product for using on the move. It’s coiled, so it won’t get in the way or tangle up on the passenger seat of your car. Of course, it’s quite a bit shorter than any of the other products we’ve covered. When fully coiled it measures just 15” long, and this extends up to 38” – shorter than all but the UGREEN cable. On the other hand, it’s the least expensive cable we’ve seen, so it all balances out. There’s also another variant of this cable that includes a microphone for the same price, so if you’re looking to connect your phone or control your car stereo with your voice, that could be a smart decision. The jacks on this cable are stepped and gold plated. The steps help to maintain a secure connection, which is important, especially if you’re going to be driving on rough surfaces. It’s unlikely that they’re going to corrode in your car, though. As a result, the gold plating may have little to no effect, although at the very least, they look good. 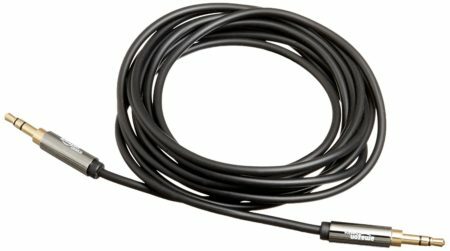 Overall, this cable is a decent choice for a vehicle, but its short length makes it impractical for day to day usage outside of a car. 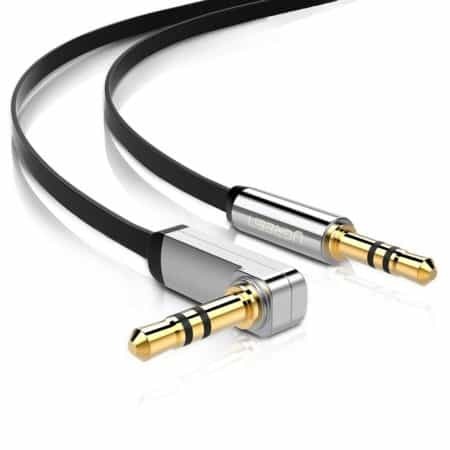 The other aux cables we’ve covered so far have one thing in common: they’re all fairly short, which makes them less than ideal for situations wherein you need to connect distant devices. Sure, it’s not a particularly common scenario, and most of the item you’d be better suited to a shorter cable. FosPower offer cables ranging from one foot all the way up to 25 feet in length, like this one. Understandably, this cable is more expensive than all the others. It costs around $15, but this added cost has gone on ensuring you have a solid and long-lasting cable. The further a signal has to travel, the weaker it becomes. That’s why FosPower’s aux cables have an insulator on the inside to help minimize signal loss. That’s not all it has, either. There’s also shielding made from copper and foil, designed to help reduce interference and keep your music crisp, clear, and free from distortion no matter how far away you are. As you might expect, the jacks are stepped and gold plated. This helps prevent them from becoming damaged, loosened, or corroded over time and really contributes to this model’s durability. But that’s not even the most exciting part. 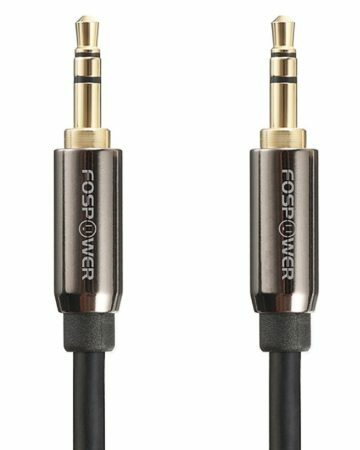 If this cable ever breaks (and it isn’t your fault), FosPower will replace it for free. In short, it comes with a limited warranty that lasts as long as your cable does, with no other rules or restrictions. We’ve reviewed five of the top auxiliary cables on the market, and now we have a difficult decision to make: which is the best overall? 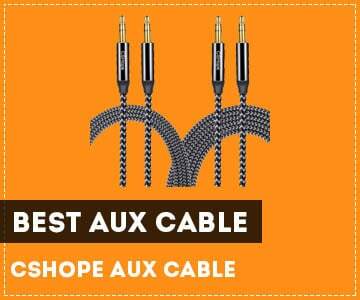 After careful consideration of the strengths and weaknesses of each product, we’ve decided that the CSHope AUX Cable provides the best value for money. For a start, it comes with two cables: one long and one short. This allows you to always have a cable that’s more or less the right length for the task at hand. They’re also very resilient, thanks to their braided cables, and they come with a generous warranty period. When you consider the facts, the CSHope cables are clearly the best for most situations.